Please join me over at Mod and Mint. 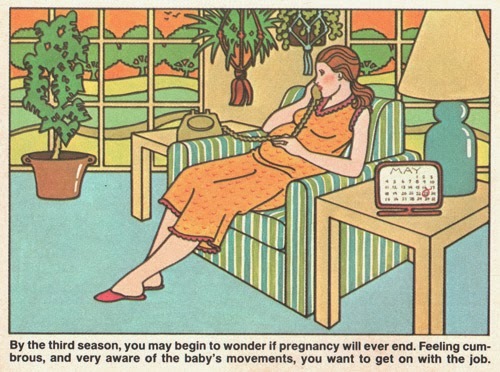 Vintage illustration, first trimester pregnancy, 1980 Parents Expecting Magazine. In the past, whenever i would think about how it would be if i would ever be pregnant, i would think about how i would slow down a bit. Take time to do things that often don't get priority in regular daily life. - Blogging, i thought i would do more writing than usual, maybe even get back to a somewhat regular schedule of postings. - All my store stock would be re-organized and photographed and given great product descriptions. - I would think about all the movies i would watch, and play the Wii on days spend on the couch. - My nail art manicure skills would be perfected by the end of the pregnancy. - I would gather all my paper supplies and loose magazines and work on my collage journals. - I would work on some craft tutorials, make a bunch of new chalkware figurines, and sew a lot of baby clothing, baby quilts and other cuteness. - The freezer would be filled with plenty of healthy dishes, ready to be warmed up after the baby arrives. 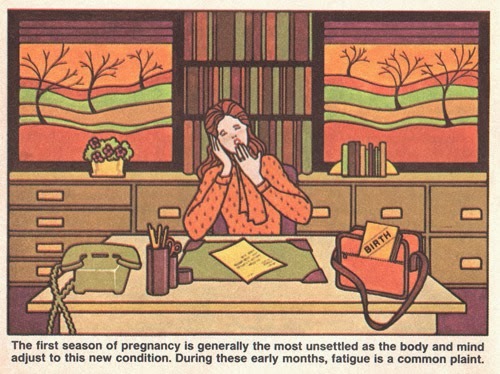 Vintage illustration, second trimester pregnancy, 1980 Parents Expecting Magazine. Oh how wrong was i. The baby is expected to join us somewhere within the next two weeks maybe and the only thing i started doing in the past week is watch a few movies. Just because moving around is getting to be a very difficult task. In all my plans i didn't think about the time it takes to find and move into a new apartment. Or the time i would spend on lists of things to research and purchase for the baby. And i also never planned on being pregnant during the busiest time of the year for my shop. The Christmas holiday shopping season. 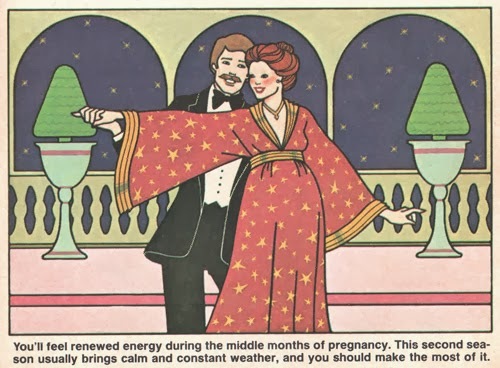 Vintage illustration, third trimester pregnancy, 1980 Parents Expecting Magazine. Blogging? Plenty of topic ideas, some even ready in draft. Finishing a post? Just something that would happen in my late night thoughts. Photographing store stock? I was happy if i got all orders packed and shipped, and all customers emails answered. The holiday season kicked in not only the last few months of the year, but also the last few months of my pregnancy. A time i definitely have less energy to get through each day. Once i did all the necessities to keep the shop running and my dear customers happy, my battery was running on empty. Nail art? Journaling? Crafting? Sewing? Cooking? I can only laugh about it now. Whatwasithinking? We're nearing the end of this adventure now. It's getting closer. And without getting into too many cliches, i can't wait to meet the baby, and at the same time i want this pregnancy to last a little longer. I'm excited scared, and excited looking forward to the next chapter. Making plans for when the baby is here? Idontthinkso..